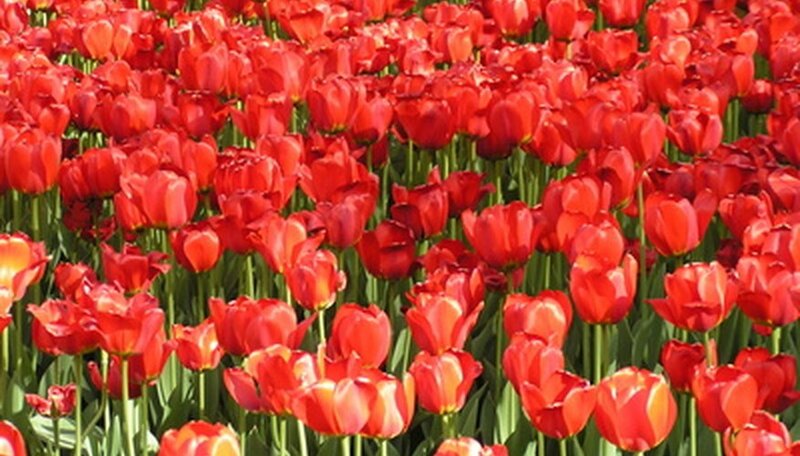 Storing tulip bulbs through the summer until fall planting helps keep the bulbs in optimum health. Lifting the bulbs after the spring flowering and foliage die-back helps prevent rodents such as squirrels from consuming the dormant bulbs. It also helps prevent the bulbs from contracting rot or fungal infections. Many people also store newly purchased bulbs until fall planting. Storing bulbs often becomes a necessity if tulip bulbs are to be transplanted and divided in the fall. Dig up the tulip bulbs gently using a hand trowel. Shake the dirt from the bulbs. Check them closely for rot or deformity. If the bulb is unhealthy, promptly discard it. Place tulip bulbs into a basket or paper bag. Sprinkle peat moss, dry sand or vermiculite around the bulbs. Store bulbs in a cool, dark place such as a cellar. Alternatively, place tulip bulbs in the vegetable crisper of a refrigerator for storage. Don't store apples or grapes in the refrigerator with the tulips because the fruits produce the gas ethylene, which will cause the bulbs to become distorted.